If you are looking for a creative way to use up all of that Easter candy, consider small wine-and-dessert pairings. Serving candy and wine in small portions to avoid over-sugaring your guests is a fun, unique way to make use of all of that candy. When tackling dessert-and-wine pairings, it’s best to make sure your wines are sweeter than the candy. This can be tricky, as I’ll discuss further in one of my pairings below. Having a wine less sweet than the candy will end up making the wine taste more acidic or bitter when it is consumed after the candy. 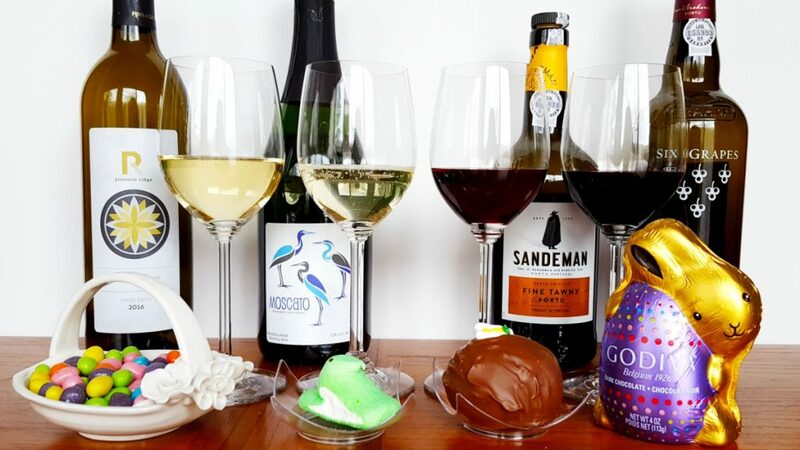 Below, I’ve selected four Easter candy favorites and paired them with four different wines. After all, there’s no reason why kids should be the only ones to enjoy chocolate eggs on Easter day! I have not previously featured the Vidal Blanc wine variety. This is a French-American hybrid white grape variety known for its tropical fruit salad and candied peach aroma. It is typically grown and produced in the Eastern U.S. and is not widely distributed across the country. You may have to do some digging to find a delicious Vidal Blanc wine, though I recently found mine at a local Wegman’s store. Vidal Blanc is incredibly enticing. While you can find dry, aromatic Vidal Blanc wines, it is more commonly produced in a sweet wine style. In the summer, I like to use this variety as a white wine Sangria base because the tropical fruit nose immediately takes your mind to a beach resort. However, at Easter time, I find the aroma and flavor reminds us that spring is on the horizon. It is always best to pair sweet candy with a wine that is slightly sweeter. While my Vidal Blanc from Pinnacle Ridge Winery is so incredibly enjoyable, it was just a tad less sweet than the Starburst jelly beans I selected for the pairing. When the wine is less sweet, you’ll notice it seems drier (less sweet) than it actually is. This is especially true after you have a taste of candy followed by a sip of wine. This is typically a wine-pairing no-no, but sometimes it’s more fun to explore new options. I like the Vidal Blanc varietal for this pairing because the wine aromas match the fruitiness of the jelly beans. Are you a black jelly bean fan? If so, pair black jelly beans with a red Lambrusco or Brachetto d’Acqui. The red fruit and floral flavors of those two varieties will contrast well with the strong anise flavor of black jelly beans. Do you have a favorite Vidal Blanc wine that would be perfect to pair with fruity-flavored jelly beans? I’m starting to envision late-harvest or ice-wine Vidal Blancs as excellent choices! It cannot be Easter without the multi-colored Peeps that arrive on the scene. However, these fluffy sugar-coated marshmallows can be somewhat difficult to pair due to their sweetness intensity. My suggestion is to pair with an aromatic and slightly bubbled Moscato. I selected a local Moscato from Manatawny Creek Winery. In the Philadelphia area, you can also find Penns Woods Winery Moscato, which is beautifully packaged in a Spring-esque bottle. The lower alcohol, higher level of sweetness, and bubbles should help elevate the sweet, marshmallow flavor in the Peeps. This makes for a delightful candy-and-wine pairing. The port I selected for this pairing was not the level of tawny I desired. However, the Port selection in most PA wine stores is a bit limited so I worked with what I had available. Nonetheless, I love the caramelized, toffee flavor of a tawny port melded with the sweet, peanut butter goodness in a milk chocolate peanut butter egg. The two feel like they were made for each other. If peanut butter eggs aren’t your thing, I suggest using a tawny port for other milk and white chocolate pairings. The caramelization of the tawny port marries the creaminess of milk and white chocolate well, making it an enticing dessert pairing option. Tawny Port could also be a consideration if you are enjoying a slice of carrot cake on Easter day. Dark chocolate and ruby Ports are a classic pairing, in my opinion. If you have someone in the family that loves dark chocolate, then ruby Ports are an easy go-to wine pairing. The luscious, concentrated red berry flavor in the Port covers the rich, dark chocolate with ease. Dark chocolate is usually less sweet than the milk or white chocolate counterparts. Thus, you can almost guarantee that any ruby Port selection will suffice for this option.